Please listen to the beautiful talk given by H.H. Kyabje Zong Rinpoche to students regarding the lineage of Dorje Shugden. Kyabje Zong Rinpoche’s student Geshe Tsultrim Gyeltsen of Los Angeles translates. Great beings such as Kyabje Zong Rinpoche and Geshe Tsultrim Gyeltsen practiced Shugden their whole lives. Masters of their calibre who are scholars, debate masters, logicians, highly sought after tantric teachers and attained beings have chosen to practice Shugden as their principal protectors must have seen Shugden as beneficial. Surely Shugden cannot fool so many high lamas for so many centuries. When masters of this calibre practice Shugden, you can be sure Shugden is an enlightened being. Listen to the transcript and be moved by the voices of two great masters talking about the Shugden practice from their hearts to their students. How they share the profound practice of Shugden who they call affectionately Dharmaphala (Dharma protector) to the students of Thubten Dhargye Ling in Los Angeles, California. 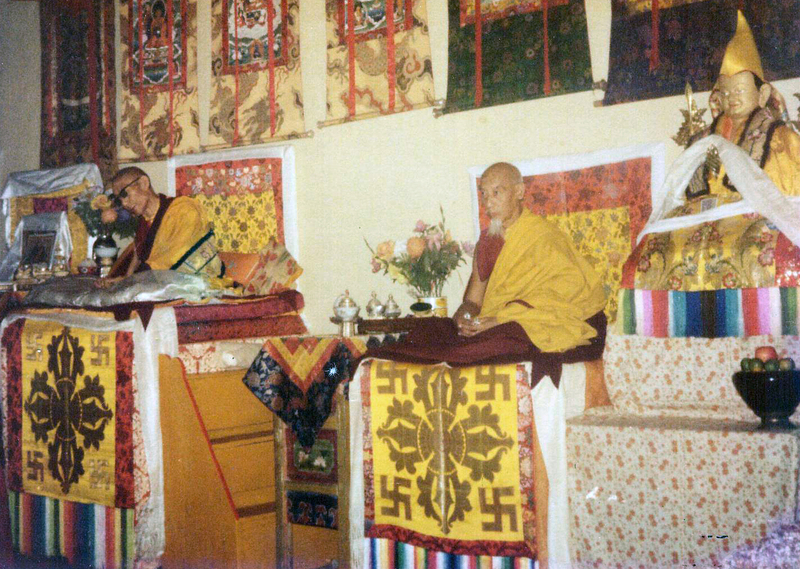 Both Kyabje Zong Rinpoche and Geshe Tsultrim Gyeltsen trusted Shugden wholeheartedly and encouraged their students to practice. Much compassion and care can be heard from this precious and rare audio tape. The Dharmapala is real and he is the emanation of Vajrapani. From the Thousand Buddhas, he is the *Sangye Hlungzey1 , the last Buddha from the thousand. He generated Bodhichita and said before the Buddha, 999 Buddhas, whatever actions of the Buddha they did, he will also do those. He started generating Bodhichita before with the *Rinchen Nyingpo2 the essence of the jewel. He started there and since then he created merit in the things he did. In our country, there was a great Mahasiddha Buton Rinchen Drub. He was also the Dharmapala. Before that in India, he was the great master of the Mahasiddha Birwapa. His name was Birwapa. In India, during Birwapa’s time, there was a very large monastery with many monks and scholars of Buddhism. There were around 500 of them together in one place and Atisha was the proud leader of those monks. 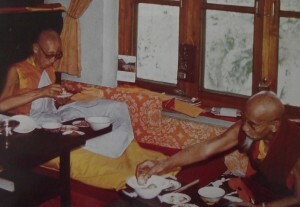 Birwapa was living in that very monastery and he was also one of the great scholars. He kept a small bottle of the wine for the tsog offering. It was his commitment of the Tantra, therefore he kept that. Atisha saw the wine and as he was the leader of those monks, Atisha said “You cannot stay in the monastery. You have to keep away from the monastery because you keep wine in the monastery. Therefore, you have to go”. He then said to Atisha, “This wine doesn’t hurt me”. Atisha said, “I know that it does not hurt you but it hurts others, therefore you have to leave the monastery”. Then when the monks were together in the chanting hall, he said “I am a bad person therefore I cannot go through the door and I have to go up”. Then he took his cushion, sprung through the ceiling and went up in space. Then he went away. When he reached the banks of the Ganga, a very big river in India, he said, “I am a bad person, therefore if I cross you, then you will be bad, therefore better you just keep away from me”. He told that to the river and at that time the river parted and he passed through. From there he arrived at a temple and in that temple the people sacrificed many animals every day to make offerings to their God. He went inside the temple right to the statue of the God and he pushed away the very strong, big statue with his knee and pushed it outside. The devotees were very upset but they couldn’t challenge him so they asked, “Please allow us to put the statue back into the temple. We want this statue back inside the temple. Please put it back there.” They asked this to Birwapa who then said, “I will take this statue back inside of the temple but you need to make a commitment, I first need something from you”. “What is the commitment?” They asked. “That you don’t kill any more animals to sacrifice to this God and also when you give an offering to this God, buy rice or any other food, if you do that, then I will put the statue back into the temple”. Inside the temple, there is also a dakini *Namkyi Jetsun3, there is also a statue of that. Then he went there and he tapped the head of the statue of the dakini. Then the dakini’s head absorbed into the body, and there’s no head. When the head went down into the body of the stone, stone body, then he pulled up the two ears, holding each ear with each hand, and brought the head back up like normal. Since then the goddess had a new name, *Lhamo Namjurma4, meaning “holding or pulling the ear”, that’s how the goddess got the name. In India, he also taught, developed and propagated the Dharma. After that, he went to Nepal. In Nepal, he saw the statue of Lhamo Chandika made from stone. Thubten Dhargye Ling where His Holiness Kyabje Zong Rinpoche gave the teachings on Dorje Shugden and Geshe Tsultrim Gyeltsen translated. 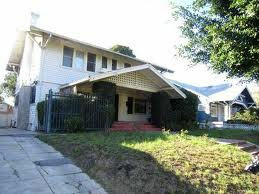 This is in Los Angeles, California. During that time, in Nepal, there are some people who check, like mathematics, like prophesise, clairvoyance, something like this. They said there was need to sacrifice animals. About 2 million animals to be killed and sacrifice within 3 years and if they don’t do that, the Nepalese government or people, the country will have very bad opportunities, or something very bad will happen. The Nepalese government, they wanted to, in fact they had to do this, because they had to care for the country but they didn’t have that kind of animal. They were thinking what do we do? Then Birwapa he said, “Take it easy, I have an idea. It doesn’t need 2 million animals but only black sesame seeds, hundreds of bags of sesame seeds”. Nepalese government need to make the sacrifice to Lhamo Chandika, and while Birwapa was performing the fire puja, some people saw Lhamo Chandika in the wood pyre, when he gave her the sesame seed through his hand, they also saw many animals, what looked like animals strewn forth. At that time, Birwapa has a very high quality or had very high reputation of the Dharma, Dharma’s power. And then after that, then his generation, in our country there is *Panchen Shakya Sherab5 . He is also reincarnation of the mahasiddha and *Panchen Shakya Sherab6 is also very great scholar but not only scholar, like a mahasiddha of scholars, a very great one. After that later, then also Buton Rinchen Drub came, also generation of the eight Shabje Sherab, come down then great scholar also Buton Rinchen Drub. Buton Rinchen Drub, after he left, he also reincarnated back during the time of Lama Tsongkhapa, Je Rinpoche, at which time, came the great mahasiddha called Dulzin Drakpa Gyeltsen. Then Dulzin Drakpa Gyeltsen also changed his life, and also then after that was Panchen Sonam Drakpa. Panchen Sonam Drakpa is the teacher of the 3rd Dalai Lama. Panchen Sonam Drakpa has good, very excellent qualities and also very high reputation and after that then, after that came Sonam Yeshe Wangpo. When Sonam Yeshe Wangpo left, his next incarnation was Tulku Drakpa Gyeltsen. Tulku Drakpa Gyeltsen was a very great scholar. Even as a thirteen year old boy, he was a great scholar, spiritual, taken to practising the Lamrim, clear self realization and the ability to teach to others too. 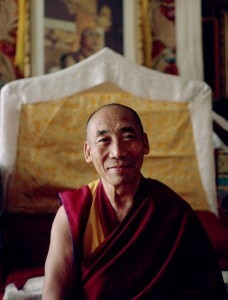 His guru is Panchen Lobsang Chokyi. He asked many times but nobody says “I’ll do it”, nobody said that. Then one day, Dulzin Drakpa Gyeltsen who was the oldest student of Lama Tsongkhapa around that time thought to himself, “This boy has come many times”, and proceeded to say “I will help you, I will help you”. Then the young boy said to Dulzin Drakpa Gyeltsen, “Don’t you forget what you told me, don’t forget’ and disappeared. At the same period, this boy, that is the time of Lama Tsongkhapa, the 1st Dalai Lama, Gyalwa Gendun Drup, he is the disciple of Lama Tsongkhapa. Since then, the Dalai Lama, the 2nd, the 3rd, the 4th and the 5th Dalai Lama also, five generations after, then Tulku Drakpa Gyeltsen came. Tulku Drakpa Gyeltsen is the, during Lama Tsongkhapa’s time he is Dulzin Drakpa Gyeltsen, he was there. Then 5th Dalai Lama’s time he came and his name is Tulku Drakpa Gyeltsen. Then Tulku Drakpa Gyeltsen said, “I don’t remember”. Then Nechung gave some barley to Tulku Drakpa Gyeltsen, “You take this, burn the barley and smell it with your nose and then you will remember”. When Tulku Drakpa Gyeltsen got back to his place and burnt the barley, he remembered Nechung as the emanation of the small boy, his promise to help and also remembered his whole past. When he remembered, he thought, “Now I need to show the form of a Dharmapala”. After that where also, then he said that Nechung, Damchen Dorje Legpa is another protector of the Dharma, very powerful. Then he said also, he talked to Tulku Drakpa Gyeltsen, “Now in this time, now is the lucky time, we have pure Dharma and this is the system of Lama Tsongkhapa that is like gold. And also, if you become a protector of that, then you will be his best one, you are the best protector of the Lama Tsongkhapa’s system of teachings”. Then next time when he went to Nechung and Nechung came through the oracle. He said “I’ll do it, I will take the form of Dharmapala but I don’t have cause of death”. What is the cause of death? Somebody to make anger or somebody to create bad action to him, then that will be the cause to become and take form as a Dharmapala. Therefore he told this, “I don’t have that kind of a problem”. Then Nechung says “You will stay in Lhasa, go into Lhasa”. “I will make a cause of death”, Nechung told Tulku Drakpa Gyeltsen. Then that’s what Nechung told to Tulku Drakpa Gyeltsen and just like that, Tulku Drakpa Gyeltsen went to the Lhasa. Lhasa is the capital of Tibet. While he was staying in Lhasa, people, Tibetan people, local people or from long distance came to see him. His reputation was much higher than His Holiness the Dalai Lama at that time. Therefore one of the attendants of the Dalai Lama, Desi Sangye Gyatso, got angry and mad and he tried to kill Tulku Drakpa Gyeltsen. Then the attendant of the 5th Dalai Lama, Desi Sangye, killed Tulku Drakpa Gyeltsen. But His Holiness the Dalai Lama doesn’t know anything, no. 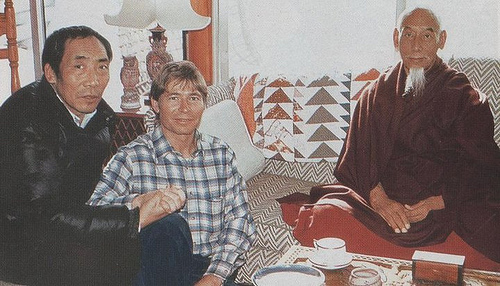 Then this attendant of the Dalai Lama he told to His Holiness the Dalai Lama, Tulku Drakpa Gyeltsen was very sick. His Holiness the Dalai Lama then said, “If he is sick, I want to go to there and I want to see him”. Desi Sangye Gyatso then said “Oh, you cannot go there. Your Holiness please you don’t go because his sickness is very dizzy. Very dizzy. Very badly dizzy. Also it is not good for you. Please don’t go”. And he stopped His Holiness from going there whilst on the other side, Tulku Drakpa Gyeltsen’s body was burned. When burning his body, very special smoke, a smoke with a rainbow together rose. Rainbow in the smoke together just like a pillar, straight into space, very long one…. Then he started to become, taking a wrathful form, a very powerful one. Then he went to Sangphu, From Lhasa to Sangphu. Sangphu is on the other side of Lhasa. They have a protector called Setrab, this is the college of Setrab. He went there and stayed there. Then there were many different kind of signs, very powerful and very strange for this country, our country. Everybody was afraid. Then the 5th Dalai Lama and his government, they tried to make a burn, through the fire puja. Very great ones, like His Holiness Dalai Lama, Karmapa, *Dorje Tra6, and many Gaden Karampa, those powerful lamas tried to make it burn with a fire puja. But they cannot burn, cannot do anything, it was powerful. Therefore then they know that, after that they put “Now you are the protector, to make the protector, then Dorje Shugden”, and since then also, from the Chinese King like that time also, his great name Dharmapala therefore… many different places also, even China, they sent many different kinds of offerings to Dharmapala and also those kind of Dharmapala hats. Since then, very powerful protector, a very powerful, great quality protector, therefore then *sog-wang7, means the initiation of the Gyalchen, since then can, when they were given the initiation of the Dharmapala… that blessed Dharmapala through the text by Lama Rinchen Wangyal. But then sometimes, that one also the text lost. Since then lost that text, and then people, even high level teachers they couldn’t get the initiations of Dharmapala. Then during Kyabje Pabongkhapa’s time and also Tagphu Dorje Chang. Tagphu Dorje Chang, a very great Mahasidda, he is very great, truly great Mahashidda. And then Kyabje Pabongkhapa asked Tagphu Dorje Chang,“Please try to get the initiation of the Dharmapala because we need it”, asked. Then Tagphu Dorje Chang he went to the Tushita Heaven because Lama Tsongkhapa is there now. And he went to Tushita Heaven and also he see that Lama Tsongkhapa and also then get the initiation for Dharmapala from Lama Tsongkhapa. Two different kinds of initiations. Tagphu Dorje Chang got it. Then from the Lama Tsongkhapa given this initiation to Tagphu Dorje Chang, Tagphu Dorje Chang gave the initiation to Kyabje Pabongkhapa, Then Kyabje Pabongkhapa gave this initiation to Kyabje Trijang Dorje Chang. 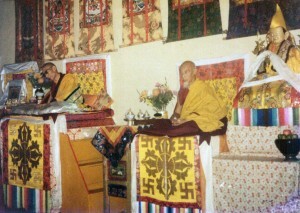 Then from Kyabje Trijang Dorje Chang gave then His Holiness our guru Kyabje Zong Rinpoche. He got three times, about three times. Then since then to gurus, it’s four generations. Kyabje Pabongkhapa is a great mahasiddha and long time because his long history and in this time also he the great action of the Dharma increasing and also make develop in the whole of our country Tibet, he is giving teachings and also develop Dharma very kind for us indeed. He is also the emanation of the Chakrasamvara, he is the real Chakrasamvara. His Holiness also says, and those kind of you have great teachers, great mahasiddhas, through that ways the initiations came and also we got and if you want more details of those real, if you want to know then it has textbook… His Holiness mentioned one textbook I had, because through His Holiness this time I got, and also maybe I can make a Xerox for you, and also you will have centre here or any other centre, therefore if you want to learn you learn from them from your teacher. Those the commentary of these texts, printing in India also if you want it, Geshe-la His Holiness mentioned where is there. This entry was posted on Thursday, January 26th, 2012 at 5:38 pm	and is filed under Articles. You can follow any responses to this entry through the RSS 2.0 feed. You can leave a response, or trackback from your own site. Through this article, it clearly shows us the history behind Dorje Shugden, telling us who he is and how he is being manifested. 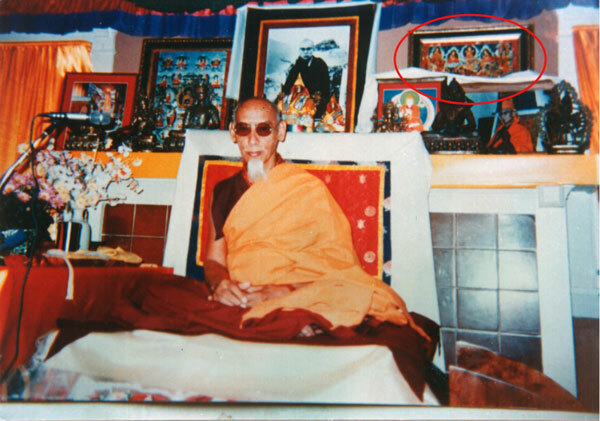 It clearly shows us that Dorje Shugden is one of Je Tsongkapa’s direct, and oldest students (Dulzin Drakpa Gyeltsen). Thus, by saying that Dorje Shugden is an evil spirit is definitely something that I would not believe no matter how it is said. If even a protector like Setrap cannot subdue Dorje Shugden, it would only mean that Dorje Shugden is an enlightened protector that has manifested in these times to bless and protect both Je Tsongkpa’s doctrine and the practitioners (us). or a completely smooth finish. Just maintain contact with the best one you are interested. enjoying each other’s company and trying to please each other.